Will Rory McIlroy get it done? Is it possible for Tiger Woods to actually win another green jacket? AUGUSTA, Ga. -- It's that time of the year where everyone in the golf world has one question on their mind: Who are you picking to win the 2019 Masters? With an 87-man field featuring generational talent going head-to-head at Augusta National, rarely has such a call ever been more difficult. All eyes are on Rory McIlroy this year as The Ulsterman looks to complete his career grand slam, but there's some stiff competition throughout the field, namely from many of his young contemporaries like Dustin Johnson, Justin Thomas and Rickie Fowler. 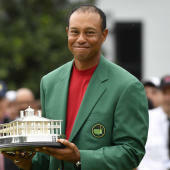 Of course, we would be remiss without mentioning Tiger Woods and Phil Mickelson, both of whom are among a litany of names looking to add another green jacket to their respective collections. Winner -- Justin Thomas (16-1): Do I feel good about it? Not really. Am I thrilled with the pick? No. But I rolled with Thomas to start 2019, and I have no intention of deviating from it. There was a hour-long stretch last time around where he got a little frisky and flirted with the top of the board, and one of the things I like best is that he's improved every year he's played Augusta National. There's a clear trajectory there that, when you combine it with his hole-less game, tells me he's going to contend here for a long, long time. Sleeper -- Hideki Matsuyama (35-1): Matsuyama's odds dropped from 45-1 or 40-1 to under 40-1 in the last few weeks, but he hasn't finished outside the top 20 here in the last four seasons. He's also second on the PGA Tour in approach shots (Thomas is first), and if he putts at all (at all!) he'll be right there until the end. Top 10 lock -- Rory McIlroy: He hasn't finished outside the top 10 here since 2013 and hasn't finished outside the top 10 in any tournament in 2019. I don't know what else to tell you. Surprise prediction: I don't know if it's a surprise, but I think Tiger Woods is going to contend early and fade late. He's coming in with better form than people think, but I think the weight of opening 68-69 will legitimately get to him on the weekend, and he'll fade to a T15 or something like that. But boy, those first two and a half days will be something. So who will win the 2019 Masters, and which long shots will stun the golfing world? Visit SportsLine now to see the full projected 2019 Masters leaderboard from the model that nailed Patrick Reed's victory last year, and find out. Winner -- Jon Rahm (16-1): We've hit a point where it feels like the top tier of golf can't get any more crowded, and yet the conversation about that top tier heading into the first major of 2019 doesn't always include Rahm. Instead of seeing Rory finish the slam, Spieth get right or another former major winner slipping on a green jacket, I think we see the strength of the field in 2019 proven by adding validation to the spark that Rahm has provided so far in his professional career. He's got all the shots, flirted with contention before last year's meltdown and has spent significant time working on his on-course attitude. I don't know if I'm ever going to pick Rahm to win a U.S. Open, but Augusta National seems to fit his eye enough to think it will happen eventually. Sleeper -- Sergio Garcia (50-1): It's absurd to have a former Masters with two top-10s in the last two months listed this far back on the odds board. Garcia absolutely can win this week, and if anything, the controversies overseas and with Matt Kuchar in match play only reinforce the chances that he's totally dialed in to where he needs to be in order make a run at winning a second green jacket. Top 10 lock -- Rory McIlroy: The way that McIlroy has been playing so far in 2019 is going to make anything short of Sunday afternoon contention a disappointment for fans, but if you're looking for a high floor play, there doesn't seem to be a better pick in the field. McIlroy needs to go low on Thursday or Friday to win, but even if he doesn't -- and especially if he doesn't -- the odds are good for at least one round in the 60s on the weekend. Whether it's winning, losing close or making a late charge, there are more ways to envision a Rory top-10 than anyone else. Surprise prediction: Rickie Fowler will miss the cut. Rickie putted out of his mind last year when he, admittedly, played well enough to win the Masters. Maybe it's a regression to the mean situation or maybe he just stinks it up on either Thursday or Friday, but overall I think our expectations for his follow-up to 2018 might exceed where his game is right now. Winner -- Rory McIlroy (7-1): Yes, he's the favorite. Yes, he's playing the hottest golf in the world right now. But I've been picking McIlroy in this space frequently over the last few years, and it's been all for naught. Not this time. Not while I'm attending Augusta National for the first time and have watched him smoke the ball off the practice tees. Rory McIlroy is going to win the Masters. He's the easy chose for a top 10 lock each year or a backdoor top five, but I think he gets it done here. Let's just say ... it's in the air. Sleeper -- Adam Scott (40-1): I was tempted to go with Patrick Reed (50-1) here, until I remembered there has not been a back-to-back champion since Tiger Woods and there's only been two in the last half-century. So sorry, Patrick, it just ain't happening. Scott is exceedingly interesting with five top 15 finishes in his last eight Masters. It may only take him being in the zone on the greens Sunday to be the difference between another one of those finishes and a second green jacket. Top 10 lock -- Justin Thomas: My normal choice in this space is McIlroy -- for obvious reasons -- when I do not pick him to win. Instead, I default to Thomas because I sure am not going with my other secondary choice in Jordan Spieth. Seeing Thomas improve in each of his three outings at Augusta National has me believing. Surprise prediction: Phil Mickelson will miss the cut. Lefty has missed two cuts in the last five Masters despite his stellar play over most of his career. It's hot here in Augusta, and the Masters is going to get away from someone quickly. If Mickelson is not nails on Thursday, it may be over before it even starts for him.